We’d love your help. Let us know what’s wrong with this preview of Dear Agent - Write the Letter That Sells Your Book by Nicola Morgan. 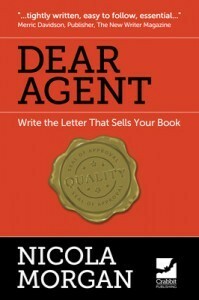 To ask other readers questions about Dear Agent - Write the Letter That Sells Your Book, please sign up. Well clear and up to the point. Now I have an idea of how to write this agent submission letter and even started writing it while reading the book. The letter is not as scary as it seems, you just have to have some common sense, be polite and clear about your genre, plot and achievements. I would even say that choosing the right agent is as important as writing a good letter. This is why now I am waiting for my Writers and Agents Yearbook 2019 which is about to come in the mail. Since I am not Br Well clear and up to the point. Now I have an idea of how to write this agent submission letter and even started writing it while reading the book. The letter is not as scary as it seems, you just have to have some common sense, be polite and clear about your genre, plot and achievements. Since I am not British, I did not understand all the jokes of the author, but the ones I did understand were really funny. Nicola Morgan has a great, dry sense of humor. She takes the fear out of writing the dreaded query letter. I enjoyed learning from her. This is a sister book to "Write A Great Synopsis", but this time the focus is on UK-style covering letters to help you net a UK agent. UK covering letters are a lot more laid back than US queries (by which I mean you won't get instantly rejected dun dun duuun if it's not perfect) but they're still important enough to stress writers out. "Dear Agent" is a short, sweet, and to-the-point read that covers all the important questions, such as should I mention multiple books, being rejected, my pets, o This is a sister book to "Write A Great Synopsis", but this time the focus is on UK-style covering letters to help you net a UK agent. UK covering letters are a lot more laid back than US queries (by which I mean you won't get instantly rejected dun dun duuun if it's not perfect) but they're still important enough to stress writers out. It also pays special attention to the tricky bits: that dreaded hook, how to write the bio section even if nothing very interesting has happened to you, and how to inject a bit of personality into the letter. It covers both fiction and non-fiction, multiple Points of View, and other sticky situations that can make the thought of summing it up in a letter more nerve-wracking than it needs to be. This is a specialist work advising how to approach a literary agent to represent you and secure deal(s) for your book(s). It focuses on preparation; preparation of the synopsis & sample chapters submission Cover Letter (US: standalone Query Letter) after the preparation of researching and qualifying the right agent to approach. I found it a useful fire-side chat with a knowledgeable Subject Matter Expert. Nicola anticipated my questions and answered them as they arose. No mean feat in a book, This is a specialist work advising how to approach a literary agent to represent you and secure deal(s) for your book(s). It focuses on preparation; preparation of the synopsis & sample chapters submission Cover Letter (US: standalone Query Letter) after the preparation of researching and qualifying the right agent to approach. I found it a useful fire-side chat with a knowledgeable Subject Matter Expert. Nicola anticipated my questions and answered them as they arose. No mean feat in a book, which is by definition a non-interactive monologue! Was a good read but full of the same information I can get for free online via publisher and agent blogs. I didn't realize the author is from the UK so the term covering letter kept confusing me. In all, a nice rehash of the same thing all agents and advice givers say with good examples of what to do. An excellent, succinct guide to writing a query letter. Full of useful pieces of advice, I would recommend this to any writer who is in the process of preparing their work for submission. Everything you need to know about writing a query letter that will sell your book. I read this book while I was writing my letter and found it incredibly useful.